Featured images for categories is one of those ideas that’s so obviously beneficial that you’ve probably not thought about it before. A Featured image can, and does, make a huge positive impact on the the post pages so it’s only natural, when you think about it, to extend that impact to our category pages with the added bonus of giving the visitor an instant visual cue as to the topic. In this Weekend WordPress Project, I’ll show you how to specify a featured image for a category and give you some tips on how to update your theme to display them. Who wouldn’t want their category pages to look like this? Step 3 is going to depend on your theme but I’m going to walk you through adding the updates required for Twenty Twelve (which has a category template) and Bosco (which uses a catch-all archive template) so this should cover most cases. Easiest way to install the plugin is to simply search for it on the Plugins > Add New page using the search term “WPCustom”. There’ll likely only be one result, click on Install Now and then Activate Plugin. There’s nothing to configure, so on to Step 2. 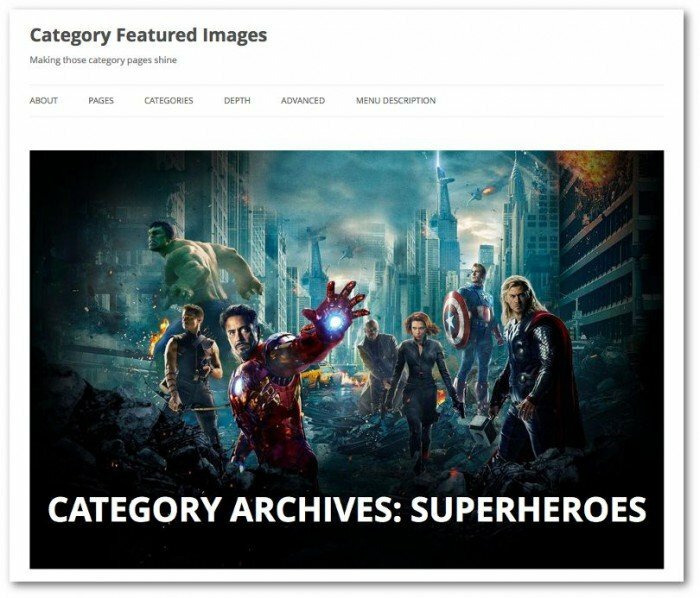 Images are added to new categories via the Add Category form or for existing categories on the Edit Category form under Posts > Categories. Pick a category and click on Edit and you’ll see an Upload/Edit Image button at the bottom. Clicking on the button opens the Media dialog where you can select an existing image or upload a new one, just like adding a featured image to a post. Add an image to a few categories and move on to Step 3. Okay, well the first 2 steps were easy: this step is where it gets a bit trickier as you now need to update your theme to output the category featured image. To a large extent this is going to depend on your theme and how it is utilizing the WordPress Template Hierarchy. Generally, themes will either have a specific category template (category.php) or let a more generic archive template (archive.php) handle all listings, not just categories. You might also need to look out for specific category pages. You can recognize these templates as they will be named category-[category-slug].php. If you’ve got lots of these then you might want to reconsider. I’ll walk through updating Twenty Twelve, which uses a category.php template and Bosco, which uses an archive.php template. Regardless of which approach you need to take, you should create a child theme for your changes. If you’re not sure about how to create a child theme then check out Rae’s excellent how to. This aging but hugely popular WordPress default theme is still a great theme to practice on. 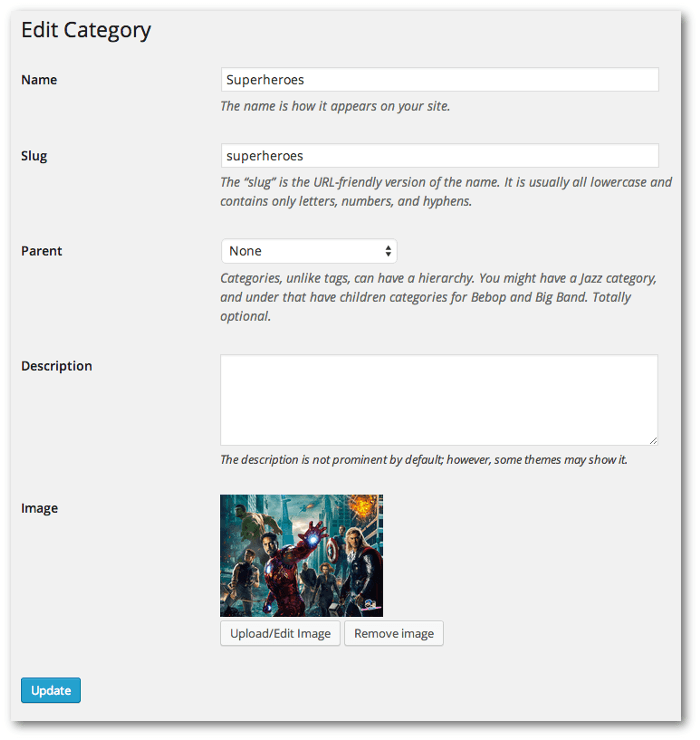 It uses a category.php, so the first thing to do when you’ve created your child theme is copy the original category.php template to your child themes folder. Now open it up so we can edit it. At the top of the page, a function provided by the plugin is used to fetch the URL (src) of the featured image. There’s an initial check just to make sure that the function exists (that is the plugin is activated) just so the template will work without the plugin being activated. As the image is going to be contained in the <header>, it’s going to be much easier to style both the image and the title itself, if an unique class is added to the <header> tag. This simple if statement will add the category-image class is a category image exists for this category. The final update for this template, this is where the image HTML is actually inserted into the page. An if statement just checks that there’s an image to work with and if there is a single <img> tag is generated with the src set to the category images URL we grabbed earlier, the alt attribute set to the category title and the desc attribute set to the category description. If you visit a category with an image you’ll see and immediate difference but the category image and the category title needs some TLC. This CSS ensures that the image itself has a width of 100% (making it responsive) and we removed any padding or margins so that it fills as much of the space as possible. Note: I did remove all the widgets from the main sidebar to ensure a full-width display. That’s Twenty Twelve, how about Bosco? Bosco is great theme from the Automattic stable and it uses an archive.php template for all its listings, so category, date, author, tag, etc. Despite this, the changes are not overwhelmingly different to Twenty Twelve. To start, copy the existing archive.php to your child theme folder and open it in your favorite editor. The grabbing of the category image URL is still at the top of the page but this time there’s an additional check just to make sure that a category page is being generated. The unique class is add to the <header> tag, just like in Twenty Twelve (note, there’s no need to check for being in a category now as it’s just a matter of whether we have a URL or not). Not surprisingly, the CSS is slightly different for Bosco although it is only slightly. The major difference is that category title has a class of page-title in Bosco rather than Twenty Twelve’s archive-title (despite the fact that it’s Bosco that uses the archive.php template). There’s also some styling for the category description to bring it up and under the title. 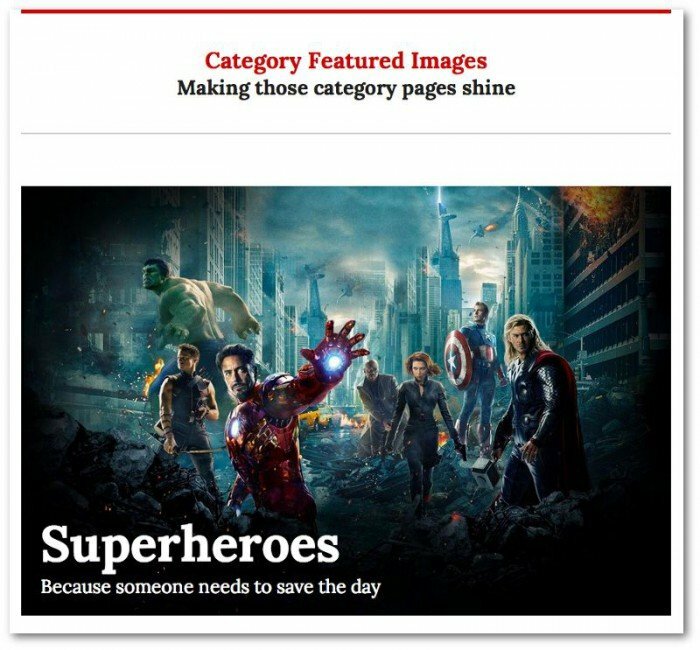 These two examples certainly show how featured images can enhance a category page in your WordPress site. As always, a lot will depend on the quality of those images but pick the right image and the results are impressive.